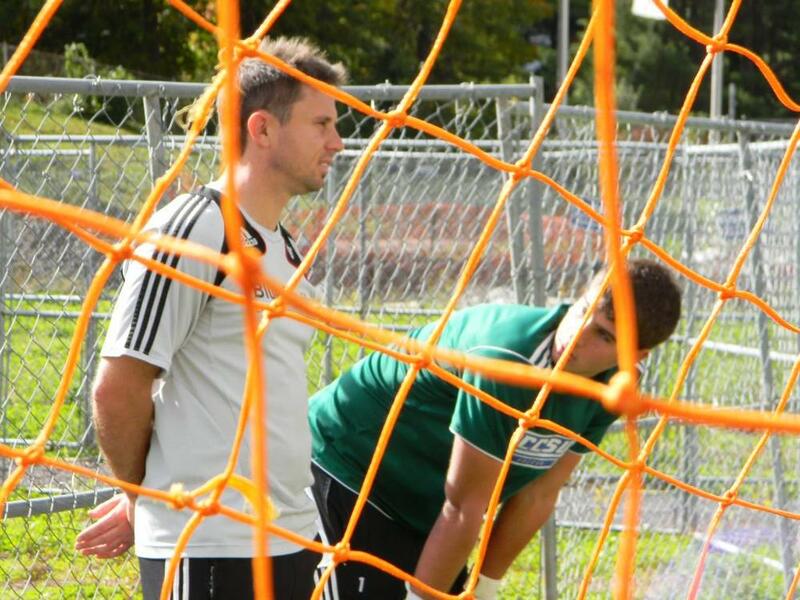 Christian from Keeperstop coaching goalkeeper from behind the net. Young athletes talk, laugh, and interact with their teammates before, after practice, and while coaches are giving instructions. Goalkeepers, the anointed general and second coach, should have no problem communicating on the field right? Then why is it that goalkeepers young and seasoned are silent as church mice on the field? It should be easy to move teammates like chess pieces? Sure the goalkeeper sees the whole field. They see the play develop and break down. To move the right back over more to cover the run from the right winger or to drop a center mid into help the center backs cover three strikers. It is difficult for youth soccer goalies and their teammates to know the roles and responsibilities of their team mates and make adjustments on the fly. The role of first defender, second defender, covering defenders and so on. The intentions of the attacking players and anticipate how the play may develop. Professional coaches miss defensive schemes, attacking patterns, and formations and they make their living from coaching players. We are asking our youth goalkeepers to do the same. Why doesn’t my soccer goalie talk? Goalkeepers and players alike are just learning their own individual responsibilities let alone the responsibilities of players around them. Goalkeepers at the highest level have trouble taking on the role as leader and communicator before the age of 24. To develop the wisdom needed to be an effective communicator the goalkeeper needs experience. Imagine you are youth soccer goalie playing 8v8 and you have 15 bodies buzzing around; coaches and players shouting different instructions; the goalkeeper parents giving instructions; and other parents also yelling sometimes less than encouraging words. For youth goalkeepers talking or better yet giving instructions is more challenging than breakaways or crosses. The difficulty in recognizing opportunities to communicate and organize is the speed of the game. The play constantly changing with every dribble, pass, touch, and shot. By the time the goalkeeper searches for the right set of words to communicate at that time the play has changed and evolved. It is truly as difficult as learning a second language. Youth players are at the beginning of their education. That lack of knowledge translates into a lack of confidence. Confidence in making decisions for themselves as well as knowing the right thing to say to players around them. For a developing goalkeeper to talk, communicate, and organize they are telling another player what to do. YIKES. Forget about the tactical implications what about social ! Youth athletes in general take everything personally. Boys and girls alike have a social hierarchy on the field. Cool or dominate players that can do no wrong. Many times a goalkeeper will communicate but it is ignored or rebuked. How do we coach the goalkeeper to communicate? Start simple and build. The “ Keeper “ call or “Away” are good places to start. Encourage the goalkeeper to call keeper loud and proud when the want the ball or when they don’t. When goalkeepers have an understanding of the importance of Keeper or Away and a general knowledge of when to use it move onto more complex communications such as asking for the ball to be played back to the keepers feet. Communicating observations with defenders. “ Paul a player is behind you”. Or speaking to a center back (another leadership positions) “ Becca ! 15 is open”. Communicating observations is easier than organizing. As the goalkeeper develops an understanding of soccer they can start communicating directions on a one to one basis. An example would be organizing “ Caitlyn mark 11 “ , or “ Nick step up” “Tony force him inside". Basic examples but you get the point. Action and accountability or who do you want to do what. After one to one communication goalkeepers can communicate such things as pressure, cover, and balancing defenders. This is where they generals in training. They start to recognize weaknesses such as unmarked players or stretched defenders and pull them in closer to sure up the defense. As the goalkeeper and coach work together to understand the formations and roles and responsibilities the goalkeeper can communicate and organize. It is important for coaches to work with the goalkeeper to organize on defending corners, setting up walls, and starting the counter attack for example. These are tactical issues that would be important and appropriate to reinforce 14 years old and above depending on the level of play. Don’t just tell the goalkeeper what is going to happen, engage them. Maybe they learned something at a keeperstop.com or another camp that you may not know or something that is confusing to them. Coach your sessions from the goalkeeper’s perspective. See what they see. You learn in licenses courses that a coach should also have a few coaching points for the goalkeeper related to the session. Keep the coaching points about the session don’t over load the goalkeeper. When the ball goes out of bounds talk to the goalkeeper about adjustments. Have or stoppage pertaining to the goalkeepers error. Fix it and play. When the ball is on the other side of the field during the match phase of the game step behind them on the field to help them organize the back four for example. Communicate your session goals through the goalkeeper. Have the goalkeeper be your voice. Help them find their voice and confidence by telling players the right thing when it is important. An often over looked part of improving goalkeeper communication is the coaches support. Coaching from behind or through the goalkeeper is a great start but we need to go further. We need to support the goalkeeper and back them up when they communicate. If a field player does not listen to the goalkeeper we need to address it. Confront the player in a positive manner. “Why didn’t you listen to James asking for the ball back”? You will reinforce the goalkeeper position as on field coach as well as educate your player in the process. If the goalkeeper has communicated the wrong instruction then address it with the goalkeeper. Hold everyone accountable in terms on communication. The art of goalkeeper communication is honed over years of practice, through game experience, support, and continued education. How hard do we have to work at effective communication in our work or everyday lives as adults? Now look at communication through a young athletes eyes with all the moving parts of the game, team personalities, and new game situations. Goalkeepers learn to talk and communicate just as they learn to catch and dive. I wrote this article after having a conversation with an accomplished Division 1 coach regarding a teenage goalkeeper. Their feedback on the goalkeeper was he didnt talk but was a very good shot stopper and athlete. The above article was basically our conversation. Contact keeperstop.com with any goalkeeper equipment and sizing as well as with goalkeeper drills. Christian - good piece. My daughter is a talking keeper. Her shot stopping skills are good but where she stands out is communicating and organizing during a game. She had very supportive coaches early on who did much of what your recommend. My question for college coaches is this: goalkeeper showcases and recruiting videos highlight saves and kicks. Understanding that coaches have limited time to watch games at showcases, what is the best way to highlight this skill so that college coach may notice? Alternatively, will a college coach always value a big shot stopper over a smaller field general type? Christian, a very good article. I have been trying to encourage my 13 year old keeper to talk more to his defence. He is not too bad but not as vocal as I want him to be. Reading your piece it is clear to me now why there is a problem at times, he doesn`t see the game situations developing as easily as I do which i hadn`t appreciated. You are right there is not enough coaching time given to this aspect of being a keeper and I have told him that if he can introduce communication into his game he will move uop a level or two as a keeper. i have printed off your piece for future reference and to discuss the contents with him, so thanks very much Gerry Welsh U.K. I would really appreciate some more pointers on what to say on the field as a goalkeeper. I was wondering if it was alright to yell a lot at your players while playing goalkeeper? or is it better to just not yell a lot?